Website Owner Company is Oberalp SPA. 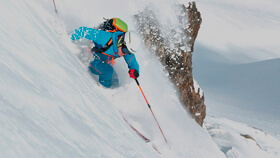 The contents of the website www.dynafit.com are the exclusive property of Oberalp S.p.A. and protected and covered by national and international legislation. Oberalp S.p.A. reserves the right to modify at any time the contents of its site and does not need to give the user a prior warning. Oberalp S.p.A. will take care that the information published on the website www.dynafit.com is reliable, correct, accurate and up to date, but does not assume, in any case, any liability for possible errors, inaccuracies, deficiencies and omissions regarding the published content, whether produced by Oberalp S.p.A. or by third parties. Oberalp S.p.A. does not assume any liability with regard to the content of any other website through which the user has reached the website www.dynafit.com nor with regard to the websites accessible through the website www.dynafit.com, and shall not be liable for any damages, whether direct or indirect, suffered by the user or third parties in relation to the use of those websites and the services offered therein.